Pretty cool study from David Nieman’s group at Appalachian State, just published online at Medicine & Science in Sports & Exercise. We’ve all heard the various theories about how exercise pumps up your metabolism so you’re burning extra calories throughout the day. The only problem is that attempts to measure this have produced all sorts of conflicting results, primarily because it’s such a pain to measure. You have to hook people up to complicated metabolic measuring equipment over and over, control for whatever random activities they do throughout the day, and so on. This new study has two big strengths. One is a fancy, newly built “metabolic chamber” — basically a tiny room where everything that goes in and out is strictly controlled, including oxygen and carbon dioxide. Measuring the amounts of oxygen and CO2 going in and out (along with exact knowledge of the food going in and human wastes going out) allows the researchers to calculate exactly how many calories the subjects burn while they’re in the room. At 8:00 am, subjects were sealed in the chamber and asked to stay in a seated position unless they needed to use the restroom or perform other necessary daily activities (e.g. washing hands, brushing teeth, etc.). Breakfast was served through an air lock passage at 9:00 am. On rest days, subjects remained in a seated position from breakfast until 12:30 pm when they were asked to get up and stretch for 2 minutes. On both rest and exercise days starting at 12:30 pm, subjects were asked to get up and stretch for 2 minutes every hour until 6:30 pm… Subjects were asked to remain in the seated position until 8:00 pm, at which point they were able to relax and lay down but not go to sleep. Bed time was at 10:30 pm, and subjects were asked to lie down even if they were not sleeping. That is very encouraging news, especially as I’d often heard the contradictory conclusion (i.e. 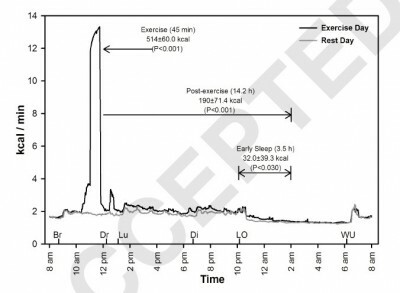 that there was no post-exercise increase to an athlete’s metabolism). Does the study indicate any plans to conduct additional studies? If so I’d be curious to see the extent and duration of the post-exercise metabolism increase as a function of the duration of the exercise, it’s vigorousness (measured as a percent of VO2 max) and whether treadmill running – versus stationary cycling – results in the same conclusions. My speculation is that since running employs more muscles that the post-exercise metabolic effect might be a bit greater (i.e. for a given VO2 max and exercise duration). The study doesn’t say anything about future research, but it does note that the metabolic chamber is “newly constructed” at the UNC Chapel Hill Nutrition Research Institute. I’d bet we’ll see a steady stream of studies with the new toy over the next few years. That being said, these studies are so invasive and labour-intensive to conduct that it’s going to take a long time to build up data. I agree that it’ll be great to see how this effect varies with intensity, duration, exercise modality, and so on. From a weight-loss perspective, it’ll also be interesting to see whether similar effects are observed in subjects who are already obese — perhaps that’s one of the metabolic responses that gets blunted. Funny that waking up at 6.30 causes a spike in both conditions. I’ve always felt that’s intuitive, but nice to see it confirmed. Any word on how this might also relate to racing- e.g. maximal effort? For my interest it would be swimming, so shorter bursts with longer warm up/ cool down times. That’s a good question — unfortunately, I have no data to answer it with, just speculation and my own personal biases! Given that 50% VO2max showed no metabolism boost and 70% VO2max showed a significant one, we can extrapolate and guess that the harder you go, the bigger the effect. But obviously it’s going to depend on duration too — hard to imagine one single 50 free doing a whole lot. And I suspect most of the warm up and cool down isn’t contributing much. My subjective feelings as a runner: one four-minute race where I truly went to the well would take a LOT more out of me for the rest of the day than a standard hour-long training run. A 15-minute race would take even longer to recover from. Does that mean my metabolism was elevated after those races? I don’t know, but I’d guess yes — and maybe even more so than after all but the hardest training sessions. Previous PostPrevious How much will I slow down in my late 30s? Next PostNext Do running shoes reduce injuries?